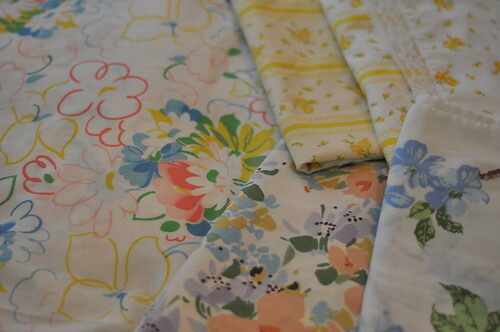 I decided I love the look of the vintage sheet quilts. Maybe because I love the memories I have of sheets. The house I grew up in didn't have central heat and air; we had a window unit in the living room. We also had one TV, also in the living room. My brother and I would sleep on the pull out sofa bed on the weekends so that we could stay up late and watch TV. I remember the sheets being so cold because the sofa was in front of the air conditioner.